Kidzter Books & Music Releases “The Kidzter Kids Meet Motown” | Avail NOW | TheUrbanMusicScene.com | The Youth Spot! 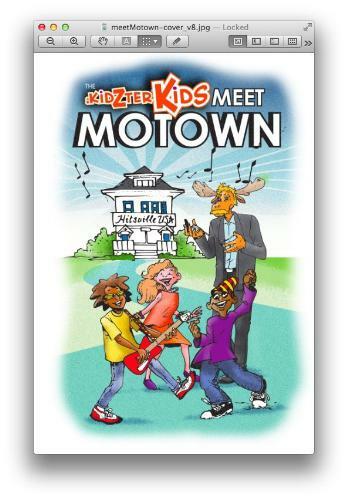 SAUSALITO, Calif., Nov. 20, 2014 /PRNewswire/ — Kidzter Books & Music has released The Kidzter Kids Meet Motown, a time-travel adventure in which the Kidzter Kids (Eva, Jimi & Carlos) go back in time to Motown in the ’60’s to learn about teamwork. “A time travel trip back to Motown’ glory days when everything was Uptight (Alright) for a trio of today’s youth. What a great way for kids to learn the love of music history,” Joel Selvin, S.F. Chronicle Music Critic & Author. The Kidzter Kids Meet Motown is the first in a series of time travel adventures in which the Kidzter Kids travel back in time to meet and learn from legendary musicians like Elvis Presley, The Beatles, Bob Dylan and Louis Armstrong. You are there with the Kids as music history happens. In the Motown book, you are there in the studio as the Supremes come up with their “hit” sound. Every Kidzter e-book book comes with a free song download. This book comes with a children’s song recorded by a group that features rock stars Marty Balin (Jefferson Starship), Maria Muldaur and John “Marmaduke” Dawson (New Riders Of The Purple Sage). The Kidzter Kids Meet Motown is written by Eva Emily Ellis, one of the twelve-year-old protagonists (with a little help from Kidzter Founder Bob Heyman) and illustrated by Jason Whitley. The book is dedicated to legendary Motown songwriter Lamont Dozier, who was kind enough to share his Motown memories. Kids can play songs, videos and games as well as join the Kidzter community at www.kidzter.com. The site also features On This Day In Music, an almanac of what happened on this day in music history. Kidzter Books & Music was founded by Bob Heyman, credited in Wikipedia with coining the terms “Search Engine Optimization” (SEO) and “Edutainment”. The author of five books, Heyman holds a Masters in Education from Harvard and developed curriculum for the National Geographic Society and the National Endowment For The Humanities. His Rock Opera “Rock Justice” (written with Marty Balin and Mike Varney) is listed in the Book Of Rock Lists. It tells the story of a rock singer who has a nightmare that his own band puts him on trial for “not having a hit”.